FEHM is used to simulate groundwater and contaminant flow and transport in deep and shallow, fractured and un-fractured porous media. 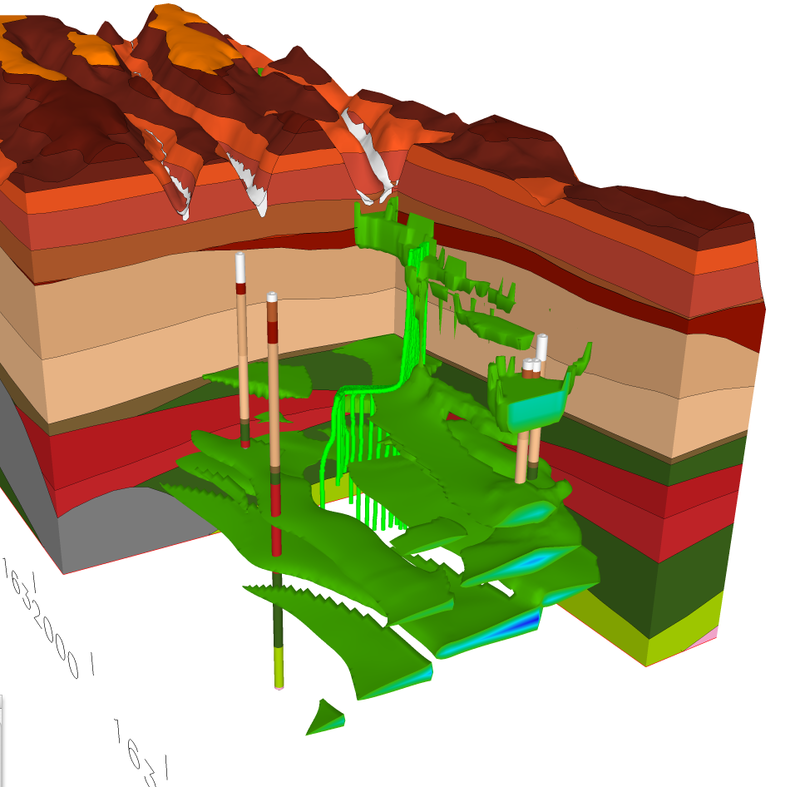 FEHM was created in the early 1970s to simulate geothermal and hot dry rock reservoirs and then used in studies of flow fields and mass transport in the saturated and unsaturated zones below the potential Yucca Mountain repository. Today FEHM is used to simulate groundwater and contaminant flow and transport in deep and shallow, fractured and un-fractured porous media throughout the US DOE complex. FEHM has proved to be a valuable asset on a variety of projects of national interest including Environmental Remediation of the Nevada Test Site, the LANL Groundwater Protection Program, geologic CO2 sequestration, Enhanced Geothermal Energy (EGS) programs, Oil and Gas production, Nuclear Waste Isolation, and Arctic Permafrost. 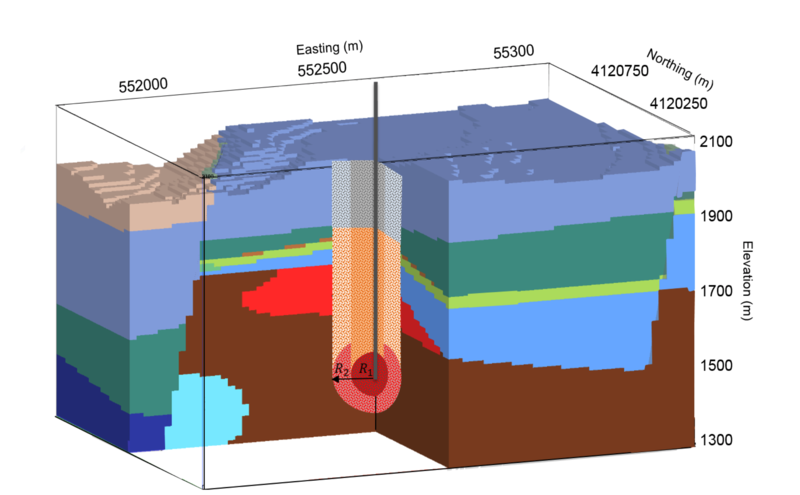 Subsurface physics has ranged from single fluid/single phase fluid flow when simulating basin scale groundwater aquifers to complex multi-fluid/multi-phase fluid flow that includes phase change with boiling and condensing in applications such as unsaturated zone surrounding nuclear waste storage facility or leakage of CO2/brine through faults or wellbores. The numerical method used in FEHM is the control volume method (CV) for fluid flow and heat transfer equations which allows FEHM to exactly enforce energy/mass conservation; while an option is available to use the finite element (FE) method for displacement equations to obtain more accurate stress calculations. In addition to these standard methods, an option to use FE for flow is available, as well as a simple Finite Difference scheme. 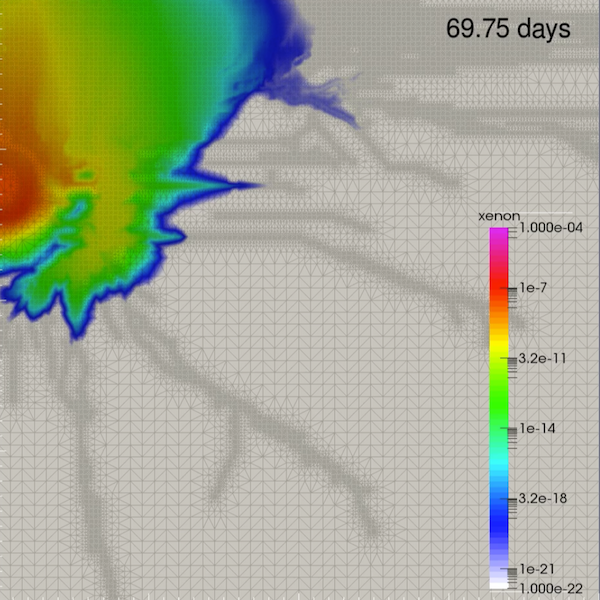 FEHM multi-phase simulation of gas transport in fractured rock due to barometric pumping. which includes hydrostratigraphic units, faults, and detonation-induced damage structure. 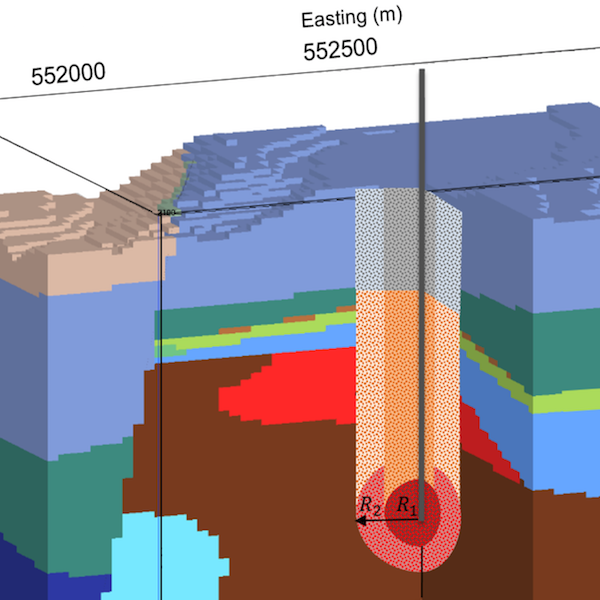 importance of barometric pumping for subsurface gas transport near an underground nuclear test site." representing potential water flow paths. Register as an FEHM user here. FEHM software is open source and available on github. FehmPyTests is a new test suite for FEHM developers to easily test new code and add new tests for existing or future functionality. FehmPyTests uses the Python unit test module and a general test method that can be called for each new test case. Future plans are to integrate FehmPyTests into the FEHM build and version control process. PyFEHM is an open-source (LGPL 2.1) Python library that provides classes and methods to support a scripting environment for the subsurface heat and mass transfer, and geomechanics code FEHM. It is inspired by a similar library, PyTOUGH, available for use with the TOUGH2 family of codes. FEHM.jl is a Julia interface for FEHM and is part of ZEM, an integrated open-source high-performance computational (HPC) framework for environmental management in Julia. WALKABOUT performs random walk particle tracking simulations of solute transport based on groundwater flow solutions from FEHM. A typical workflow for Walkabout within the FEHM system would use LaGriT to generate unstructured grids. FEHM then provides a discretized representation of the steady-state flow field to Walkabout. Given this discrete solution, Walkabout then reconstructs a groundwater flow field, and performs the random walk particle tracking calculation. LaGriT (LANL Grid Generation ToolBox) for creating and writing FEHM mesh and model setup files. GRIDDER rectangular grid generator for creating and writing FEHM mesh files. 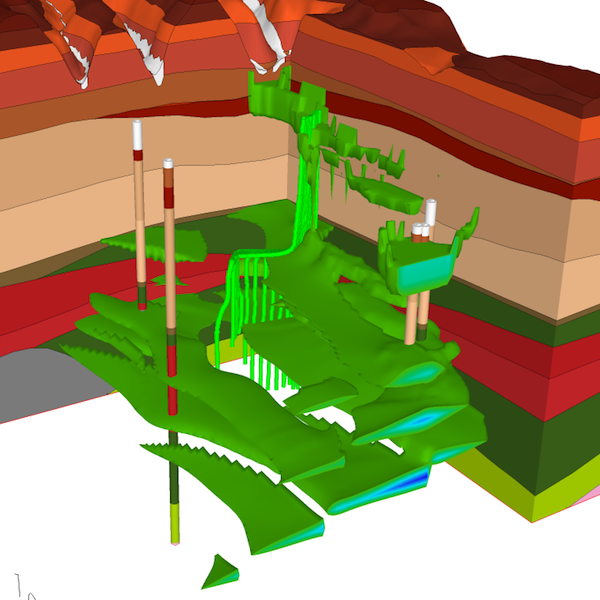 SOILVISION SVOFFICE 5/WR integrates user friendly front-end numerical analysis and visualization software with the FEHM Control Volume Finite Element solution engine. Hydrogeologists can perform groundwater flow analysis of large-scale, thin layer regional models and leverage capabilities such as double porosity / double permeability and non-isothermal multiphase modeling of water / vapor. Modeling Gallery with assorted images from FEHM modeling projects. Copyright © 2018. Los Alamos National Security, LLC. Copyright © 2018. Los Alamos National Security, LLC. for FEHM LA-CC-2012-083: This software was produced under U.S. Government contract DE-AC52-06NA25396 for Los Alamos National Laboratory (LANL), which is operated by Los Alamos National Security, LLC for the U.S. Department of Energy. The U.S. Government has rights to use, reproduce, and distribute this software. NEITHER THE GOVERNMENT NOR LOS ALAMOS NATIONAL SECURITY, LLC MAKES ANY WARRANTY, EXPRESS OR IMPLIED, OR ASSUMES ANY LIABILITY FOR THE USE OF THIS SOFTWARE. If software is modified to produce derivative works, such modified software should be clearly marked, so as not to confuse it with the version available from LANL.